Hello and welcome to another edition of Sealed Success! Ultimate Masters hits this weekend in the paper world and with most stores offering the box topper as the prize for winning the draft, I imagine we'll see more correct drafting now than we would in other Masters sets. A brief overview tells me the fixing in the set it is not as prevalent as it was in Modern Masters 2017, in fact I'd wager to say there is very little fixing here. Furthermore, with the Heroic mechanic and Slippery Bogle in the set I imagine there will be a decent amount of aggressive decks coming out of these drafts. This leads me to believe you can't really durdle in this format and it should be faster than Modern Masters 2017. I'll draft it at least once in paper to see if I enjoy the format or not before committing do any drafts on Magic Online. Should I do any drafts on Magic Online they'll be phantom as the set itself is not as valuable online and therefore less of a reason to pay such a high price tag. I've been ruminating on how to proceed with my competitive sealed leagues since I've never liked the formats I've had in the past: 1-2-2 and 2-1-2. I want to present them in a way where the third week always has something to look forward to, but what do I do in the instances where I'm already 0-3 and out of prize contention? My solution to this problem is to do something I've not tried before: 1-1-3. In this format no matter what the third match will always matter and be worth watching, making the third week of the league actually worth recording. In the instance where I'm 0-2 and lost the third match then we can stop like normal, but in the other formats I would have no reason to do the third week of matches. I hope this format will be better of everyone involved, so if you have any thoughts on it please do let me know. The first pick of the draft was definitely hard since I had multiple options worthy of a first pick. 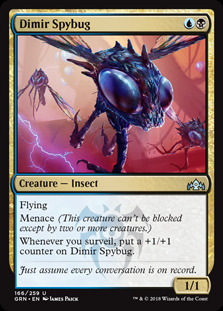 I'm looking at Mission Briefing , Dimir Spybug , Artful Takedown and Deadly Visit , with the most sensible picks being Mission Briefing and Deadly Visit . 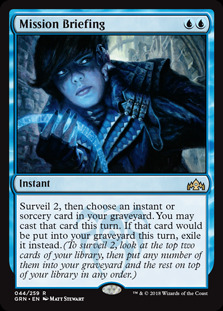 Ideally here you want to pass on the gold cards since you don't want to start in Dimir while passing a Dimir signal, so taking a mono blue or mono black card is desirable here. 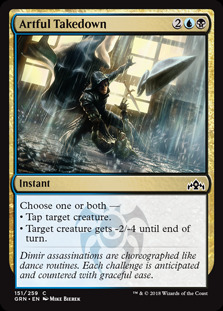 If you take Briefing you can be Izzet and avoid a fight for Dimir, while taking Deadly Visit allows you to be Golgari and avoid a DImir fight. I personally like blue more than black and know if I take a blue cards I might get cut from some blue cards if I send a Dimir signal, so I take the color I like least because it may be Golgari is underdrafted and I can make a strong deck. Unfortunately for me I don't think Golgari is open and so I start to pivot towards Selesnya after eschewing it in pack 1, which is not the ideal move to make but better than trying to force a guild I already don't believe to be strong. The move to Selesnya works out as I'm able to get two Flight of Equenauts , Light of the Legion , and Dawn of Hope . I did get lucky getting two strong rares to fit into my deck but sometimes you need a little luck when you realize you're not in the right color combination. I went 2-1 overall with this deck and I'm happy with the result given the color switch I had to make in pack 2. Selesnya works best when you're able to flood the board early, go wide, and keep pressure going with your Convoke spells. Worldsoul Colossus , Siege Wurm , and Flight of Equenauts are much more powerful when they're played turns before they should be, forcing your opponent to have immediate answers or be put in a bad position. I have to admit I was really surprised after I finished recording and saw I had one more game to play. Since game 1 went on for so long and game 2 was about the same length and ended in defeat, I had thought I lose the first game as well. I completely forgot I drew Aurelia late in the first game and won with her in play, I only remembered it once I started recording again for the third game. There's no doubt in my mind that Aurelia, Exemplar of Justice is the reason I'm 2-0 right now in this league. 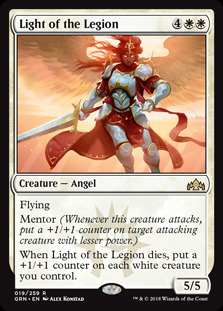 While I do have an aggressive Boros deck I lack some of the better Mentor creatures and Aurelia provides me a path to win in the air and by brute forcing my creatures past my opponent's defenses. The +2/+0 trigger on the right creature can force my opponent to have to use their best blocker on defense early, and with it out of the way I can make better attacks with my other creatures. 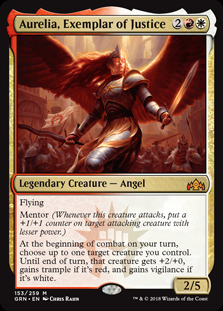 Aurelia is a card if left uncontested will win you the game barring a superb defensive position from your opponent, and we saw that proven correctly thus far in the league. It may be that I can only go so far without Aurelia, leading me to defeat if I'm unable to draw her. The pack I added after the first stage didn't offer me much for my Selesnya deck so all I did was add a Selesnya Guildgate and run it back in this stage. I felt the deck was better than a 1-2 record and was willing to give it another go unless I felt I needed to change decks/strategies in certain matchups. Even though I only dropped one game this entire stage I thought I had some interesting games which could have gone either way but thankfully went in my direction. 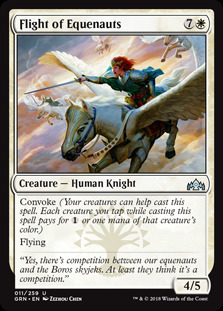 The deck is at its best when you're able to play to the board and use your Convoke spells early to wider than your opponent can handle on defense. 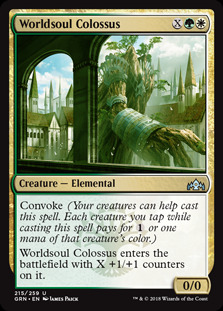 An early Worldsoul Colossus or Siege Wurm backed up with 4-5 creatures is pretty tough for a regular deck to deal with, making it one of the best ways Selesnya can overpower an opponent early on. 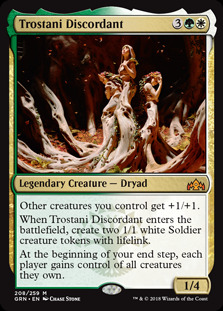 For the reasons stated above Trostani Discordant can be a very powerful play if you have any sort of board presence early because combat now favors you and your opponent is facing down more power than they originally thought. Flower//Flourish can do the same thing but has the advantage of being able to set up early land drops should they be more important than a +2/+2 effect. Forward momentum is critical in decks where having snowball effect is ideal, so being able to hit key land drops to continue to develop is quite huge. Have you ever been in a situation where someone is ahead on board and if they skip a beat they lose all momentum they had and now find themselves on the back foot? Sometimes it's because they run out of spells, and while we can't help that too much, we can help the situations where missing land is the cause for panic. In other words, don't be afraid to use Flower to get a key land if you're not comfortable taking a chance on the top of the deck. We had a good day today going 6-1 overall in matches played while adding a trophy to our name in the friendly sealed league. Next week I'll be back with a recap of my Ultimate Master draft along with the usual Guilds of Ravnica Limited content. 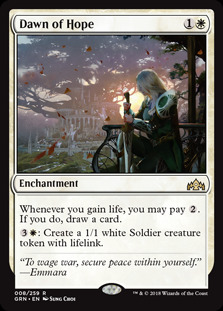 In a few short weeks we'll be thinking about Ravnica Allegiance so we don't have too much time left with Guilds of Ravnica. If you have any comments, questions, or concerns leave them in the comments section below. You can subscribe to my YouTube channel here where you can find all my videos uploaded early along with exclusive content for the channel. I've been slacking on making extra videos but I'll do my best this week to get something going.